They’re been a wardrobe staples for a long while now, and don’t seem to be shifting out of the trend game. But you can get into the same routine of wearing your favour tee with them. 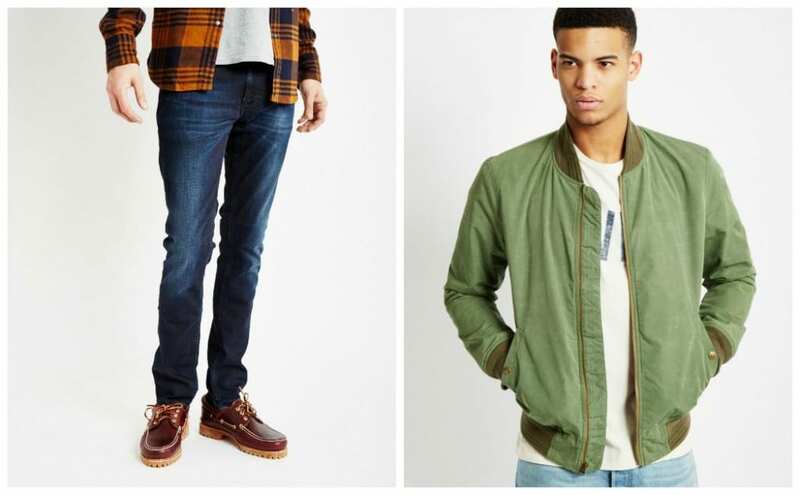 Mix things up with this guide on how to style skinny jeans 3 ways. When it comes to what to wear on bottom half there’s a high chance that most will go for a pair of jeans. The choice of style, colour and fit of jeans is never ending, but it’s likely that within any jeans collection there is at least one pair of the faithful skinny jeans. Since the noughties it’s been impossible to go into any clothes store, men or women’s, and not see skinny jeans on sale. The fashion item has grown massively from the 70’s; when skinnies were only seen on the likes of rock’n’roll bands; and those wanting a rebel image. Early 2000’s saw indie groupies follow in their footsteps, before skinny jeans gradually took over; and now an everyday item in any wardrobe, compared to being restricted for a certain style genre. As with most pairs of trousers, it takes time to find the perfect fit of skinnies. With jeans in particular, once you’ve found that perfect pair you won’t want to wear anything else. But how can they be worn in different ways? Skinny jeans haven’t become a wardrobe essential for no reason; they can be styled for a casual daytime look, a dressed-up date night look and even a sport luxe look. This guide will break down the way a pair of skinny jeans can be worn showing how versatile they really are. With skinny jeans being the obvious – skinny and fitted – it’s a good idea to contrast the top half of your outfit with something less fitted. As a result, the fit and style of the jeans, which is really what makes a pair of skinnies; will receive the attention you want. Also, on the plus side you won’t feel completely trapped in a tight outfit from head to toe! An ideal choice of top to make this style work is a checked shirt which will add a bit of colour to the outfit; especially if pairing with black skinny jeans. Wear the shirt open with a simple t-shirt underneath, the safest option being white; or a shade that complements the shirt’s colour. With a lighter denim jean, contrast the shades with darker colours on top to similarly allow the jeans to stand out. Wearing an oversized top layer can work in any season. Colder weather is when you’ll want to layer up, so a jumper in autumn shades such as army green and burgundy; is a comfortable way to create a stylish, daytime outfit. A simple collared shirt underneath the jumper will smarten up the outfit or can stay tucked out; hanging over the top of skinny jeans, for a casual layered look. When it’s time to ditch the sleeves, a simple, slightly oversized t-shirt design goes perfectly over a pair of skinnies. Choosing a branded t-shirt with a statement design or logo will add a sports luxe feel to the outfit, and works perfectly teamed with a pair of trainers and bomber jacket. Skinny jeans are the best choice of jean for smartening up an outfit, particularly in black or dark denim. Team with a button up shirt for an overall smartened up outfit, paired with leather lace up shoes, such as brogues. 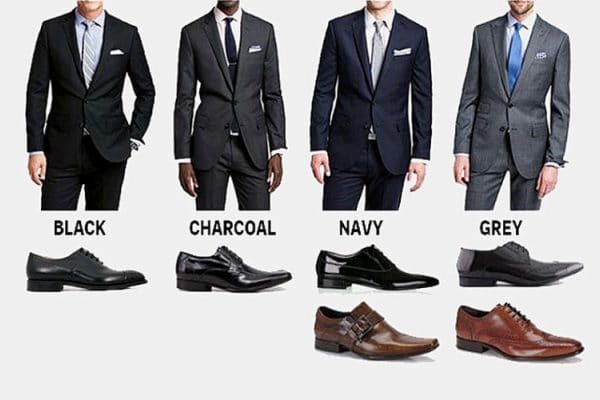 Black shoes will go best with the black skinnies, whilst brown will complement dark blue jeans. Base the shirt choice on the colour of your jeans. Stick to lighter shades with black jeans, such as a pale blue or grey; and a simplistic yet stylish white with dark blue jeans. 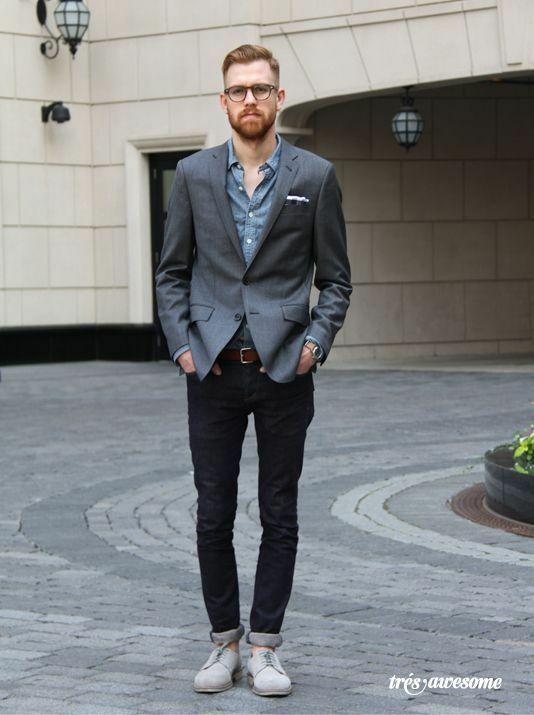 Skinny jeans even work well with blazers and ties for a stand out look. 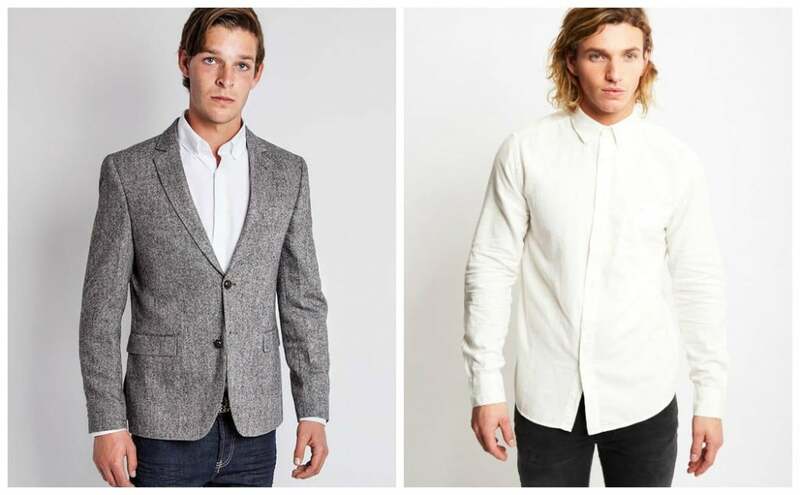 A tweed blazer will smarten up any outfit. Just team with a white shirt, dark blue skinnies and brown shoes, and you’ll have a winning evening style. If you don’t fancy a jacket and just want the shirt layer, a simple tie complementing the jeans colour; is also a quick fix for smartening up an outfit without ditching your favourite jeans. The simple trick of rolling up a pair of skinny jeans at the ankle can create a completely versatile outfit. Take the pair you smarten up for an evening look, roll up and they can now be part of your daytime casual outfit. Obviously this works best in the summer, or that mid-season difficulty of what to wear when it’s not cold but not hot! Lighter shades always work best in warmer months. A cool shade rolled up with a summery t-shirt or vest, is ideal for a laid back look. That same pair of jeans you loved in winter can be given a quick cuff to pair with casual shoes; such as trainers or even flip flops in the real summer month. 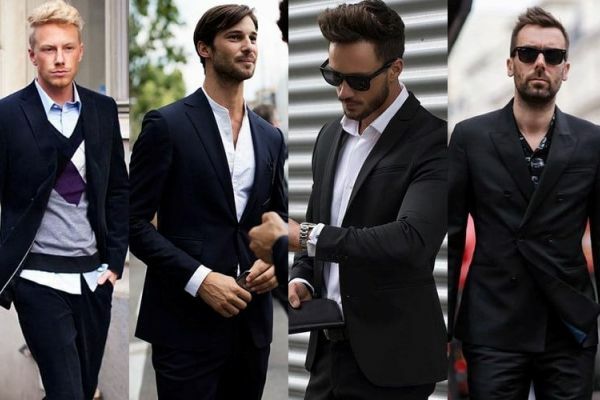 It’s a simple trick to change up an outfit, but important to get right. 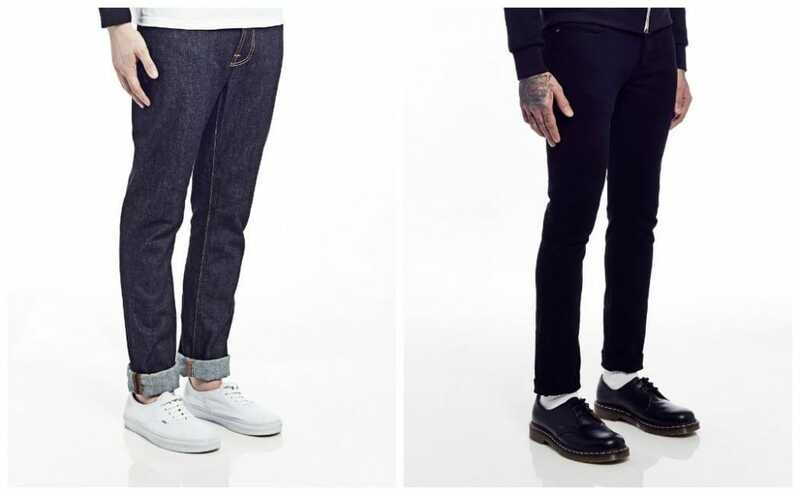 The skinner the jean, the skinnier the cuff, so don’t over-do it. Ideally, fold up the hem twice, to be showing the right amount of ankle. Since breaking out of their stereotype, it seems that skinny jeans are here to stay; which makes our outfit choosing a lot easier. 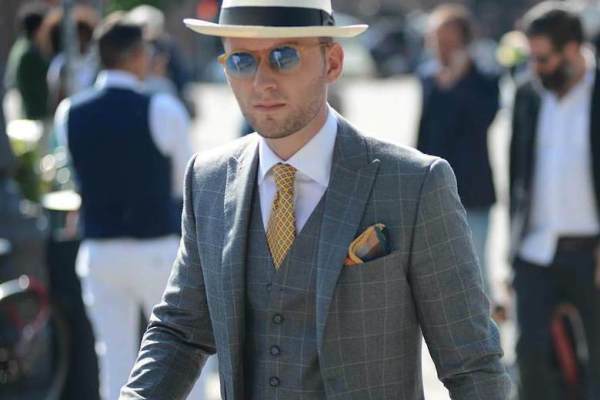 Love them or hate them, its clear why they are such an essential item to have in your wardrobe. 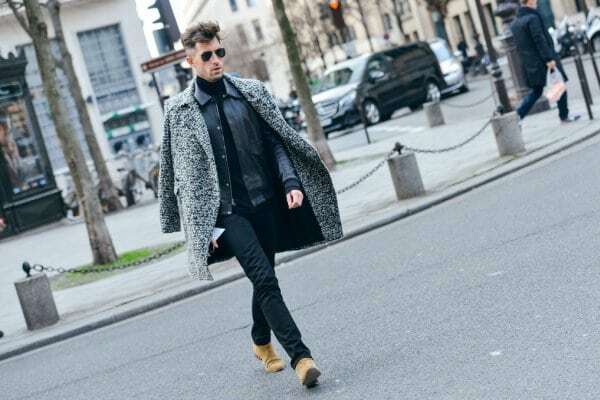 Be it day or night, smart or casual, skinny jeans can be styled with almost anything; all year round, to create a timeless and comfortable look.